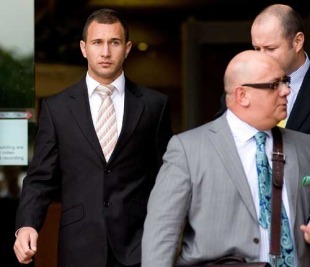 Burglary charges against Australia fly-half Quade Cooper have been dropped after police offered no evidence against him at his latest court hearing. The 22-year-old was arrested last year following an alleged break-in at the Surfers Paradise resort in Queensland and the charge has hung over his head throughout this season. Cooper was originally ordered to complete a course of counselling by the Australian Rugby Union but was later recalled to the Reds sqaud for the Super 14 season and named Australia's Player of the Season. Cooper, who pleaded not guilty at an earlier court session, has been training with the Wallabies in Sydney ahead of their Tri-Nations opener against South Africa on July 24. Local media reported that his lawyers had entered into a mediation process with the complainants and police. Director of Chesterfield Lawyers, Dan McManus, said mediation was an accepted part of the Queensland justice system. "It can only take place with the willing participation and consent of all parties, including the Queensland Police Service," he told AAP. "Justice mediation is a confidential process and the parties cannot elaborate on the content or details of the events nor the process which has led to this outcome. "Due to the confidentiality constraints of the justice mediation process, it is not appropriate to comment publicly further now that this matter has been disposed of, and no further comment can be offered." An ARU internal review has been conducted following the matter, with Cooper fined $7,500 due to the negative publicity generated. He has also been ordered to continue with support programs initiated at the start of the year. "I want to thank everyone who's helped me during what has been a challenging time, particularly family and close friends," he said. "I'm glad I can now just concentrate on playing well for Australia." Cooper, who is set to retain the Australia No.10 shirt for the clash with the Springboks in Brisbane, was also reprimanded last year for his role in a food fight at the Wallabies' team hotel and later fined $10,000 by the ARU for bringing the game into disrepute following a dispute with a Brisbane taxi driver.